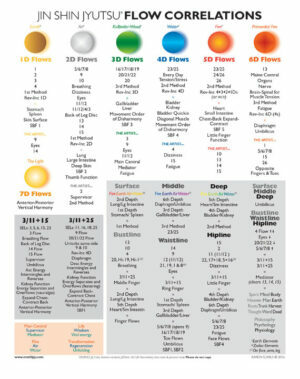 This chart is a comprehensive listing of flows that can be used to harmonize a particular depth, to harmonize bustline, waistline or hipline, and to harmonize surface, middle or deep (relating to body function energy flows). The chart also includes a listing of flows that are harmonized by simply holding 3/11+15 and 3/11+25, as well as the word associations for the 3 universal flows and for the bustline, waistline and hipline relationship. I first developed this chart as a companion to the Lumbar Circle Chart, but it quickly became a much-used reference for finding flows related to a particular depth or to bustline, waistline and hipline. Chart content derives from the 5-day seminar classes, handouts, personal notes and JSJ Texts 1 & 2. After completing your purchase, you’ll promptly receive a link to download the e-chart. If you don’t see it, check your SPAM and Junk mail folders. You can download the chart once: download the chart before viewing or printing it. Be sure to download to a device that you can then print from. For best results, print the e-chart on a color inkjet printer. Flow Correlations Chart © copyright 2017, Karen Searls. All rights reserved. The Flow Correlations Chart is for your personal use and does not come with distribution rights. No part of this chart may be reproduced, stored in a retrievable system, or transmitted in any form or by any means – electronically, mechanical, photocopying, recording, or otherwise – without written permission of the copyright holder. Purchases are made through PayPal using your credit card, debit card or your PayPal account or charts may be purchased by check, when drawn on a USA bank.